Wire Mesh|Test Sieve|Nails and Fastener|Air Nailer|Hebei Jinsidun (JSD) Hardware Co.,Ltd. With more than ten years experience on manufacture and international business, JINSIDUN (JSD) Hardware has engaged in four field: Wire Mesh , Nails and Fastener,Hydraulic Equipment. Our factoies are located in Tianjin and Xingtai which are famous with hardware products in North China.And we have sales office in Shijiazhuang City . Advanced management system,modern e-quipment, perfect testing manners and well-educated employees guarantee high grade products and good delivery time.We can supply good services with sales person's good experience on international trade, such as declare at customs, booking space, and forwarding products. Now we are working with our customers from Europe, Canada, Middle East, South Korea,South America, South and East Arica etc. JINSIDUN Hardware have been always sparing efforts on Quality Creates Value. We warmly welcome customers from all over the world and hopes to create a bright future with you. JSD Hardware always pay much attention to the quality control. Advanced management system, modern equipment, perfect testing manners and well-educated employees guarantee high grade products and good delivery time. All of the JSD workers are skill and quality mind trained before taking the job and have 2-3 months practice period before independently operation. Most of our equipment are full-automatic semi-automatic, which guarantee the accuracy of JSD products. JSD manufacture products according to the requirements of IS09001 strictly. All of our steel wire rod and steel plate are purchase from State-owned steel mill Such as Tangshan Steel Mill, Xingtai Steel Mill etc. Inspection Personnel check randomly the products according to the order requirements to rectify the mistake in a earlier time. Inspection Personnel makes general tests on the finished products. If the products dosen��t comply with the order requirements, They will require the production Dept to reproduce or modify it. 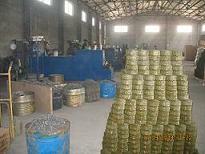 JSD has workshop of packing process. Different size products pile at specific space and marked by different name plate to avoid mixed packing. Inspection Personnel takes the final inspection randomly from the packing-finish products to guarantee the right delivery. Employee to trace the whole process from production assignment making to delivery. Copyright © ICP:09026995 2009 HEBEI JINSIDUN (JSD) CO.,LTD.